When I was young I always had a vision of riding motorcycles. I got my first bike when I was 10 years old and started riding with zero ability. My neighbors mentored me early on with riding until I started racing locally when I was around 13. To get parts and entry fees I would find part time jobs to support my moto habit along with some additional support from mom & dad. I held jobs doing anything from stocking grocery shelves to washing dishes. Then at 16 I started working the parts counter of the local Honda dealer, Fischer Cycle. There was nowhere else I would have rather gone after school to earn some parts money so things couldn't have worked out much better. Growing up in Northest Ohio, riding friends and tracks were sparse. However I did have access to a couple riding spots that have long been abandoned but they helped me hone the skills that I would find to change my life. I had a strong passion for riding as a kid. The beginning years of riding I spent countless hours in those desolate ride spots. Racing on occasional weekends until I advanced myself into the local pro ranks as a teen, I would finally reach for the bigtime and try racing some outdoor nationals and supercrosses. Having enough luck and skill to qualify for a few races I had a tough time staying healthy. Motocross is a tough sport and its mistakes can be costly. Getting injured on a regular basis compounded with the costs of going to the races eventually led to a dream that never happened. Whith a little help from my pop, I found myself in the construction trade as a union laborer at the age of 19. The next few years would be full of strenuous labor and little ride time. Knowing the money was good, I still had a void that was longing to be filled. Lay-off is common in the winter months when the work slows so again, with a little push from my dad, Xtreme Sports, a parts and accessory shop in conneaut Ohio, was founded in 1995 with plans to stay open part time when work picked up in the spring. Well, spring came and so did the call to come to work but I had things cooking at the shop, so for the next few years I would find myself back into motorcycles. Looking to promote my new business I began racing heavily around the local area trying to build my new store's name with wins and an occasional heelclicker or can can just for fun. My riding career had actually began to grow better than it had ever been when George Quay and Pro Action sponsored me and I did a few amateur nationals and was even a test rider for Dirt Rider magazine on a few occasions. Things had gotten about as good as I thought it could get when one day in the spring of 1998 when I was deep in some parts shipments and customers, the phone rang. Not that Xtreme Sports hadn't grown to the point that the phone didn't ring endlessly but this time it wasn't for a tire or some gear. A guy had seen an ad for my store in RacerX (when it was still a newspaper). 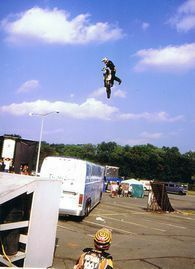 He called the shop looking for sponsorship of a new tour that was going on the road featuring freestyle motocross. My business was not the caliber necessary to promote such a thing but I mentioned to him that I could do that stuff and he said to send him a video. When asked at the end of the tour where my final flight destination would be, I knew the second freestyle contest ever held was coming up in a few short weeks in Southern California. I made the decision to go to SoCal and stayed with some friends while the freestyle scene began to explode. Riding in the hills where the filming took place for the videos that until recently I had only seen and sold, would become a lifestyle. After a year and half of chasing the sport of freestyle contests and demos I had earned enough to purchase my first home in the suburbs of sunny Riverside California. Focusing on improving the few tricks that existed then, I traveled to as many shows as I could book. For the next few years I would appear in between 45-50 events per year. Earning myself the nickname "Trevor From Wherever", I was based in the "909" and found much media attention being in the "hub" of the motorcycle world during the beginning of this new phenomena. This type of exposure led to many endorsements but the most memerable would be when I was looking for some help from Yamaha's Terry Beal. Living in the heart of the moto scene I was deeper than ever in the magazine testing department. Knowing what the manufacturers loaned out to people I was seeking some help with an extra bike as I was always shipping mine to the next event leaving me with nothing to practice on. 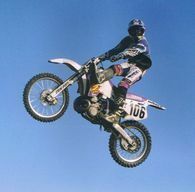 One thing turned to another and I became the first ever factory sponsored freestyle MX rider in the year 2000 when Yamaha signed me on for much more than I originally anticipated. The sport continued to grow and I would appear in demos at the World Super Bike Race at Laguna Seca, the US Open of SX in Las Vegas, the Indianapolis 500, the Ice Village at the 2002 Winter Olympics in Salt Lake City, along with several entries in the ever popular X-Games and Gravity Games contests and hundreds of IFMA contests across the country. I have even had the opportunity to perform at DisneyLand and was Cameron Diaz and Crispin Glovers stunt double in Charlies Angeles! My lifes dreams had become a reality! Life has had its twists and turns for sure though as in 2002 when I broke my femur and shoulder in a crash in Portland Oregon. Putting a sudden damper on my career I knew a lengthy rehab would follow. Once able to function I still knew I may never be as competitive again as I once was so I focused my efforts on the previous purchase of land in my native state of Ohio. I have always had a dream of operating my own MX track. So I made that dream into reality when I opened TV Land MX in 2005. We now have many sanctioned races throughout the year and I have a place to teach the skills that I enjoy so much. A young TP lookin' at me - Hanging out on the Warped Tour at 16 years old, it's no wonder he's the creator of the Nitro Circus.